This is a product guide to help you determine what kind of black plastic sheeting is best for your project. If you already know what you are looking for and are ready to buy, click the 'To Webstore' button above. 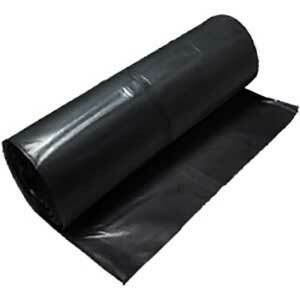 Our black plastic sheeting comes in many varieties, sizes, and mils and can be used in landscaping, organic gardening, construction, and general protection against dust, moisture and dirt. Black plastic visqueen is ideal for garden solarization because it is a strong absorber of sunlight and gets very hot. Garden solarization is the process of completely covering a section of turf with non-porous plastic to prevent anything at all from growing. Furthermore, the extreme heat generated by the black plastic kills any aggressive weeds or rhizomes underneath the plastic. This is helpful in gardening because it allows for a complete 'reset' of a given area and can destroy hard-to-kill weeds like Bishop's weed that multiply under the ground with rhizomes. Solarization is often the only way to kill these kind of aggressive weeds short of replacing the soil. Solarization is also used in farming to decontaminate soil and reduce pests in preparation for planting. Usually 4 mil plastic is sufficient, but if the installation is long-term or subject to harsh weather conditions, you may want to consider 6 mil or 10 mil instead. There is another landscaping use for black visqueen; the woven variety is widely used as a weed barrier. The porous nature of the woven sheeting allows water to pass through to nourish the existing soil and plants (it is cut around existing plant stems) while the tight weave prevents weeds from growing. When this method is used, the sheeting is traditionally covered with mulch or sod (the small roots can grow down through the weave) to give a pleasing, natural appearance. Lastly, 4 mil black flame retardant plastic sheeting is standard in all haunted houses. Fire code requires that haunted houses use flame retardant plastic, black is appropriately spooky and dark, and 4 mil is strong yet economical enough to cover large spaces and walls. Click the button below to browse our selection, or read a description of each type in our product guide below. All with free shipping over $25! Standard 4 mil is our most economical offering of black plastic visqueen. It is often used as a weed barrier in landscaping where total weed prevention is desired. It can also be used for short-term garden solarization (using total cover and solar heat to destroy everything growing in the soil, from aggressive weeds to pests and fungus. It can be used outdoors or indoors as a huge, inexpensive tarp to prevent liquid or dust as a result of messy activities from contaminating surfaces. It can be used to cover and protect outdoor machinery and construction materials in the short term; the dark opacity will prevent others from seeing the contents. Lastly, 4 mil can be used as a dust barrier in installations where hazardous particulate is not a concern and opacity is preferred, such as construction and renovation. 6 mil black visqueen has many of the same uses as 4 mil (weed barrier, temporary protection, economical tarp) but offers more strength and long-term durability. For example, a weed barrier in a climate with harsh winters would need the strength of 6 mil to resist splitting and wear. Temporary protection during a storm, winter, or long-term storage would be better with the extra thickness of 6 mil. Additionally, 6 mil is strong enough to be used as a dust barrier in abatement situations when an opaque barrier is desired. It is also strong enough to be as as a vapor barrier in concrete slab. Carefully judge the scope of your project to determine whether the price difference between 4 mil and 6 mil puts your project at risk; often, 6 mil is the better choice. With free shipping over $25! 10 mil black plastic sheeting is the strongest we offer (in black) and is used when the installation requires the very best, strongest, and most durable in long-term strength and endurance. 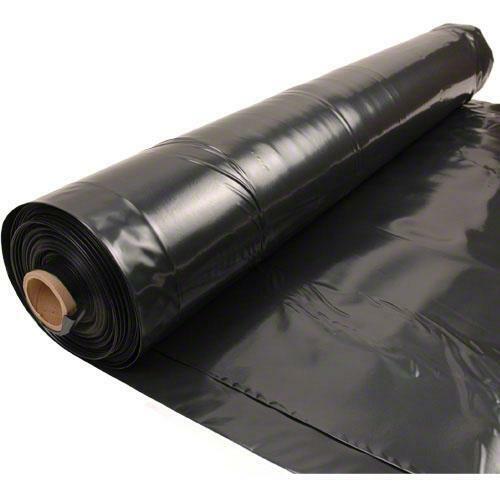 Use 10 mil black plastic sheeting for a weed barrier that will last for a very long time and that nothing will penetrate or tear, even with heavy foot traffic or in harsh winters. 10 mil is also commonly used as a vapor barrier for an even more effective seal than 6 mil can offer. Highly dangerous abatement situations such as mold or asbestos may use 10 mil black as a dust barrier. The ominous black color warns others of danger (especially combined with caution tape) while the highly tear-resistant and durable 10 mil thickness provides a solid barrier against the hazardous particulate and spores. 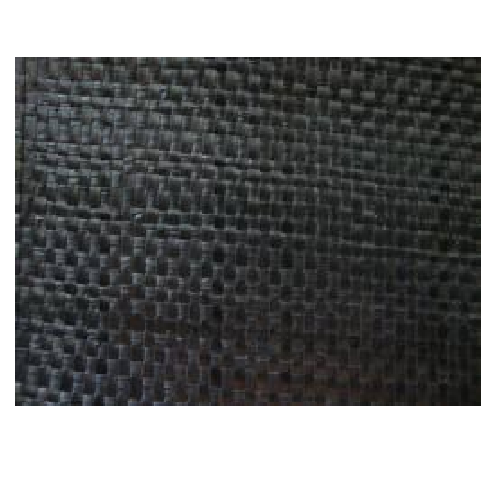 The woven style of black plastic sheeting is used in specific situations where strong but porous material is required. It is regularly used all over the world as a weed barrier when existing plants are meant to remain. The holes created by the weave allow water to pass through to the soil and nurture existing plants, but the weave is tight enough to prevent weeds from growing. When used in this way, it is cut to allow room for existing stems or to reveal soil for new plantings. Very often, it is covered with sod or turf that can grow roots through the weave. Woven visqueen is also highly wind-resistant, making it excellent for use as a scaffolding or as temporary enclosure material where high winds are a concern. This is the standard in haunted houses all over the US. Fire code requires that the black plastic sheeting that covers haunted house walls be fire proof. Our 4 mil flame retardant / fire proof visqueen meets these parameters and each roll is sent with a fire certificate that attests to its flame retardant test results and quality. Meets or exceeds NFPA 701 test 1, ASTM E-84 and California Title 19 for use in indoor dust barriers, partition curtains, equipment protection, and more.